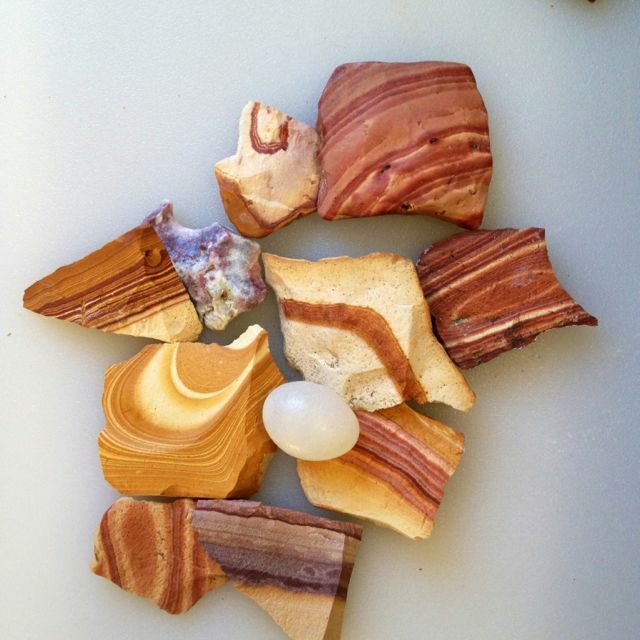 Today I will be writing about a slightly different topic… one that is still quite nerdy, but one that is also near and dear to my heart- agates; Lake Superior’s treasure! My Grandfather first introduced me to agates when I was a little girl. He shared his passion for the hobby with me and my interest in them has grown ever since. Keep reading to find out more about these beautiful gemstones. An agate is actually a variety of the mineral quartz. Specifically, an agate is made up out of layers of chalcedony (kal-SED-oh-nee); a very hard material. These layers build up in gas bubbles (aka vesicles) within rocks. These layers create the banding pattern that agates are famous for. So how exactly does one find an agate? There are a number of clues that can signify that you’ve found an agate; aside from their popular banding, which may or may not be visible. Waxy luster– Agates with freshly broken and weathered surfaces tend to have a waxy shine or luster to them. Translucency– Even though other minerals may be banded, few tend to have the translucent property that agates do. When held to sunlight, an agate will appear to “glow.” This is why it’s often recommend to go agate hunting during the early morning or late evening -when the sun is nearer to the horizon; this can allow you to see the agates “glow” as the sun refracts through/off of them. Hardness– Since an agate is a type of quartz, it is quite hard. So hard in fact, that it cannot be scratched by a steel knife. Conchoidal fractures– When struck, quartz tends to break in a conchoidal fracture due to its brittleness. This type of fracture results in semi-circular cracks and chips. Pitted surface– When an agate is whole, it can be much harder to identify. In addition to the waxiness, one should look for a pitted outer surface; which is caused by minerals that protrude into the agate as it forms in a vesicle. Chert– often banded but typically only found in shades of brown, white, and gray; plus they are opaque rather than transparent. Rhyolite– occasionally banded, these volcanic rocks are opaque. 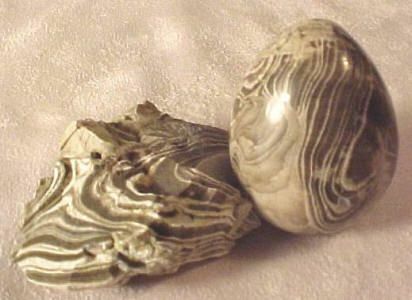 Jasper and Jaspilite– While often layered, the layers tend to be poorly defined and not circular in nature. 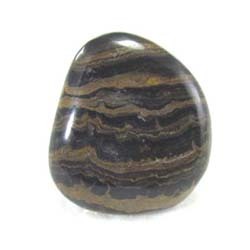 Additionally, Jasper tends to be more opaque than an agate and jaspilite will contain broad black metallic layers of hemalite, not found in an agate. Stromatolite– these rocks tend to contain twisting layers that are not circular in nature and they tend to be opaque. 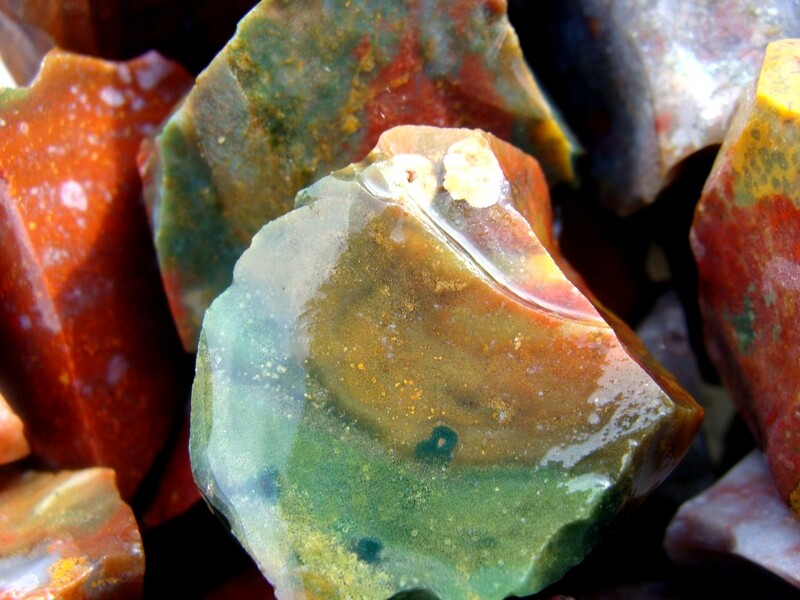 Agates initially formed along the shores of Lake Superior. Since that time, they have been carried throughout the region by glaciers and rivers. Since your best chances of finding the gemstones are in areas where the earth/soil has been moved, the Lake’s shoreline, riverbanks and beds, as well as gravel pits all make great locations for finding them. Please note that most pits are privately owned and can be dangerous, so ask for permission first and exercise caution when traversing. This post only begins to scratch the surface of agates. There’s a lot more information out there about Lake Superior agates including more detailed info on where to find them (Moose Lake, MN has an annual agate festival each year), the types of agates and their rarities (eye agates are one of my favorites), how you can display and use agates (jewelery is a common use), as well as how to polish them (not all agates should be polished according to the experts); just to name a few topic categories. Agate necklaces my Grandfather made. The black agates are known as Apache Tears. Thanks to my Grandfather passing on his passion, I own a double barrel Lortone 33B rock tumbler and always have my eyes on the ground scanning for agates wherever I walk. This post is written in loving memory of him -in order to keep the hobby and passion alive and share it with others! Keep in mind that different agates are located all around the world. Research your area to see what treasures may be around for finding! Questions about agates or agate hunting? Are you a rock hound and feel I left something out? Let’s discuss in the comments below! This is a super informative post. It’s making me wish I lived by Lake Superior. Do you collect any of the look-alike stones? I would be excited to find any of those. Your grandpa made really pretty jewelry. Those are some gorgeous samples up top. The bolo tie is awesome, too. Your grandfather had style! Agate is one of my favorites, it just has so many possibilities with colors and bands and etc. Very true -that’s one of the neat things about agates; the varieties…each one is so unique! Thank you Lindsey! Such a fun pastime isn’t it?! I did know about Agate day in Moose Lake. I’ve been agate hunting there, but have not had a chance to attend the festival yet.